The U.S. Navy has completed shipboard integration testing for two unmanned systems on a littoral combat ship in an effort to enhance the vessel’s mine countermeasures capabilities. 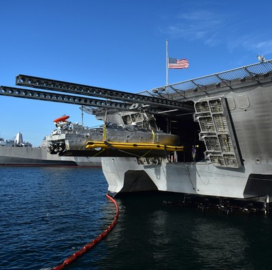 The service said Thursday that it tested the Knifefish unmanned undersea vehicle and the Unmanned Influence Sweep System aboard the USS Independence. The two systems are part of a Mine Countermeasures Mission Package built to provide LCS with system-to-system communications supporting the MCM detect-to-engage sequence. During the test, Knifefish and UISS verified communication links between Independence and other unmanned systems and enabled the ship to make multiple launch and recovery operations. 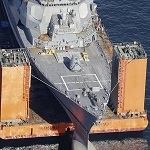 Following the test, the Navy certified all aviation modules for the MCM MP for deployment on Independence-variant ships. The technologies work to detect and neutralize mines in the water. The Navy plans to begin initial operational test and evaluation of the mine countermeasures drones by 2021.